Flowing through Kent County from its eastern border to its west is the Grand River. The Grand River discharges into Lake Michigan at Grand Haven after it flows through Ottawa County. The Grand has three tributaries in Kent County that many river front properties are located on, the Flat River located in Lowell, the Thornapple River located in Ada and the Rogue River located in Belmont. Rivers of plenty where fishing for trout and salmon are right up there with the best. Travel on any road in Kent County and you are sure to come across one of the approximately 180 lakes ranging in size but always welcoming. 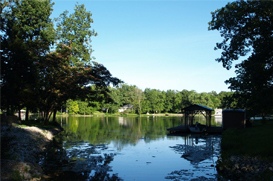 Oasis with parks, boat landings and nature trails for walking and bird watching. There is amble opportunity to own a home on water front property which can offer convenience to a variety of water sports, fishing, beauty and much more.